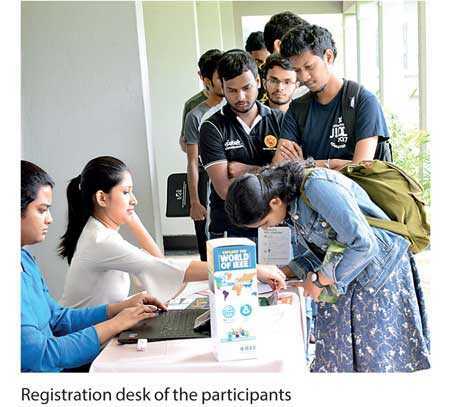 Venture Frontier Lanka, in partnership with IEEE Sri Lanka Peradeniya Student Chapter, IEEE Women in Engineering, Young Entrepreneurship Society and Innovators’ Club of University of Peradeniya, organised the Venture Frontier Lanka Entrepreneurship Caravan – Kandy phase at EOE Pereira Theatre of the Engineering faculty of University of Peradeniya last weekend. The event was attended by around 70 university students. Speaker Chris Doering, Design Thinking expert of Venture Frontier Lanka, introduced the university students to the design thinking process through an interactive session of designing a wallet based on the interests of the person seated next to them. Then in tandem ICT Agency of Sri Lanka Program Manager Sachindra Samararathne did a collaborative and networking session where he explained that the event itself was a form of collaboration and networking opportunity to all the participants present. Next in line was Rainco Ltd. Managing Director Fazal Fausz, who spoke to the participants about his journey as an entrepreneur and expanding his company into 13 different companies along the way. This was followed by Sharanyan Sharma’s success story as an award-winning entrepreneur and the hardships he faced throughout his journey to become an entrepreneur who owns five companies at present. The last speaker of the day was Thuru App Co-Founder Hasanka Padukka. He spoke about social entrepreneurship and how their app was developed to the place where they are at right now. National partner LOLC Group was a key enabler of the event. The next event by Venture Frontier Lanka will feature Joe Hadzima – Senior Lecturer, Martin Trust Centre for Massachusetts Institute of Technology Entrepreneurship, on the topic ‘Intellectual Property and Technology Transfer’ today, 10 October, from 6:15 p.m. onwards on the Venture Frontier Lanka Facebook page. Applications for National Startup Challenge, which will be held on 10 and 11 November at Dialog Axiata Auditorium, are now open. Please visit the Venture Frontier Lanka Facebook page or contact Sasmini Bandara on 0777 997874 for more details.